While most people start dreaming of "what they want to be when they grow up" early in life, very few people are fortunate enough to actually end up in a profession that they enjoy. 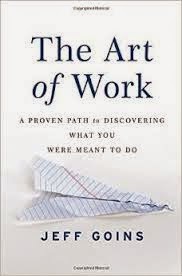 Jeff Goins, in his new book The Art of Work, attempts to help people identify the signals in their lives which will lead them to satisfying, productive work. Through interviewing many people who are working in fields which demonstrate their "true calling," the author has identified seven stages of calling, including awareness, practice and mastery. Each of these stages is discussed in detail in its own chapter. The main points that seem to occur over and over are that you should be aware of opportunities and not see failures as a reason to quit. Since 87% of workers are unfulfilled by their jobs, everyone should be open to opportunities to do work that will be both important and empowering. Many of the people whose stories are told in the book came into their current work through misfortunes or difficult situations in their lives. Others saw their dream careers fade due to injuries or lack of motivation, with no idea what they were going to do afterwards. Through seemingly random encounters, they were set on a path to their true calling. One famous such person he mentions is William Hung. Even though he had a disastrous audition on American Idol, it lead to an online following and 3 albums. However, after achieving a modicum of musical success, he discovered that his dream was actually to work in the field of mathematics. Sometimes you need to figure out that what you think you want is not really what will make you happy. The real test is to recognize the calling of what you should be doing with your life, and not to be discouraged by failures. The author himself quit his full-time, secure job with benefits in order to become a writer. Not everyone will recognize what their true calling is, but by being mindful of opportunities, listening to "that little voice" inside you, and not being discouraged by failures, people can find their true purpose in life and leave a lasting impact on the world.